Norwegian promotion code 2015 up to 30% discount all flights! Low cost airlines Norwegian, continuously awarded as best European low-cost carrier have launched just for today brand new promotion code granting up to 30% discount! This promotion code is possible to apply to all flights and destinations in scope of Norwegian. Remember that only hand luggage up to 10kgs is included in base fare. (max dims 55x40x23 cms). To use this Norwegian discount code just choose your flight. Before you proceed put below voucher code to separate field. Look for box Do you have a campaign code in left bottom corner. Just press show campaign prices and your fare will be automatically discounted. (This discount applies to base for of the ticket not to taxes and fees). This Norwegian promotion code 2015 is possible to use only today 27th of November 2015. Travel period is till 13th of March 2016. There is also blackout period 16.12.2015 10.1.2016 and 11.-23.2.2016. Norwegian airlines are connecting Scandinavia with rest of Europe. They are also offering long-haul flights e.g. to New York, Oakland, Las Vegas, Puerto Rico or Bangkok. Booking sample of successfully applied Norwegian promotion code 2015. In this case you would fly from UK to exotic Caribbean isle Puerto Rico this year in December. 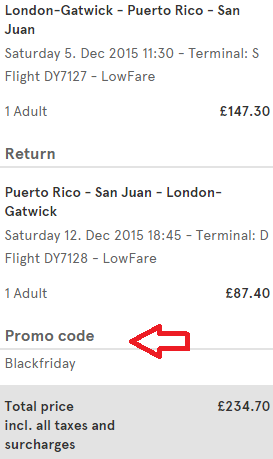 You would departing from London Gatwick to San Juan on 5th of December. Your return flight from Caribbean back to Europe would be on 12th of December 2015. You would pay total £234.70 for a round trip ticket. This includes all taxes and fees as well as checked in luggage.